Broadway Lights was designed by Kathy Lincoln for a quilt retreat for our local quilt guild, the Burke Chapter of Quilters Unlimited. I chose these colors to imitate what the lights look like from stage. Placeholder One normally hangs above our fireplace. I chose the design (which was created by Laurie Shifrin), but my husband was skeptical. He suggested this quilt would be a “Placeholder” until I made something we both liked. Luckily for him, he liked the quilt once it was completed. Ironically, he has no memory of this converation. Hmm. Time Flies is the first quilt I ever entered into a juried show. I aimed high; the quilt hung in Houston at the Quilt Festival. Fiddle Dee Dee was one of the fastest quilts I’ve ever made. Lonni Rossi was visiting my guild and I volunteered to make a sample for her new pattern and line of fabrics. The quilt was done in record time and traveled with her to hang in show booths. In stark contrast, MonarchChromatic took longer to make. Each bead, each bauble, each Swarovski crystal was affixed by hand with needle and thread. I love the tiny rainbows that dance around my living room when the sun hits the crystals just right. Click here for more details about this quilt. The quilts will hang through March 2008. 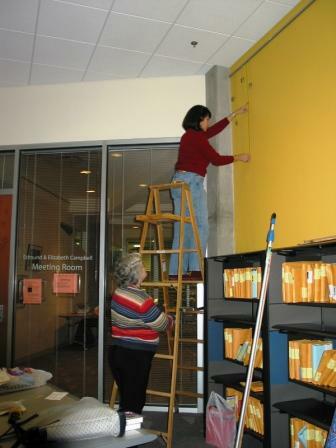 I thank Kathy Lincoln for helping me hang the show and making sure I didn’t fall off the ladder. A special thanks goes to Dyann Bishop of the Shirlington Library for making this all possible.